An Organization is one of the most heavy-duty, versatile components of TouchPoint. It’s called an organization, because it helps you organize. This is a 2 1/2 minute overview of organizations. Organizations are used to help you minister to people. Lay leaders can have the OrgLeadersOnly user role and access people connected to the organization / class they lead. An organization without members contains attendance for meetings (a Headcount) and guests for meetings (Worship Service, Special Event). In this case, the organization is tracking unknown people (using a headcount) as well as known people (guests, using individual attendance for them). A means of grouping together those with certain common attributes (all those who are home-bound, all who use Facebook). At the top of the organization page is the section for the details relating to that organization. That includes the Name, Organization Type, Campus, Leader Member Type, Schedule, Organization Status, and Main Fellowship flag. You can click Edit to make any changes to these. You can edit the organization’s Program & Division on the org itself by clicking the existing Program & Division in the header. Members - Those currently enrolled in the organization. We display the person’s Last Attended Date (with the number of days since he attended), the Join Date (with the number of days since he joined), and the person’s attendance percentage in that org (this looks back 52 meetings, or since the person was enrolled). Previous - Members who have been dropped from the Organization. The person’s Last Attended Date (with the number of days since he attended) and the Drop Date (with the number of days since he was dropped) will display by his name. Inactive - Members who, for whatever reason, are not considered active. We created this for deacons who serve a 2 or 3-year term and then go inactive for year before returning as active. Pending - This is used during Annual Promotion to place members in a class in a pending state prior to the actual promotion date. Prospects - People who have been associated with the Organization, even though they may not have attended yet. Guests - People who have attended a meeting, but are not current members. Guests may or may not be on the Prospects tab. The person’s Last Attended Date (with the number of days since he attended) will also display by the name. Options - Select options to view multiple tabs, show the street addresses, show ministry info, and show hidden records. The Options tab has the following action options that relate to how the people are displayed and what information is display. The Options tab label will change to display whatever option(s) you have selected). Select this option and then select any of the other tabs whose list of people you want to view in one list. You will see each list incorporated under the Members Tab and can run reports or send emails or texts with the group of people you are viewing. Example: Click Options > Select Multiple > then Members and Guests tabs. You will see a list of all the Members and all the Guests (that are not hidden) in one list. Select this option to view any Prospects and/or Guests that have been hidden from view. See below for more information. By default, in order to save space on the page, we do not display a person’s address. If you select Show Address, the complete street address will display below the person’s name. On both the Guest and Prospects tabs you have the option to Hide a record. You would hide someone if you do not want to see that person in the list anymore. You can always change it back at any time. If a guest visits again and you have hidden him in the list, he will display again automatically. This is useful for someone that visited a long time ago and you know does not plan to return. The options to Hide, Join Org, and Add as Prospect are links in the Member Type column on the Guests and Prospects tabs. The Previous Members tab has the option to Re-Join that is also in that same column. 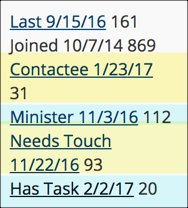 Look in the Member Type column on the Guest or Prospect tab. Click the Hide link and answer Yes, continue to the prompt. That person will no longer display under the Guest tab unless he visits again. If the record is on the Prospects tab, it will remain hidden unless you show it again. Select Show Hidden from the Options tab and this will display any Prospects or Guests that have been hidden. The link in the Member Type column changes to Show. Click Show if you want to stopping hiding that record. On both the Prospects tab and the Guests tab you have the option to select Join Org in the Member Type column This will make that person a Member of the org. On the Guests tab you have the option to also add that person as a Prospect by clicking the Add as Prospect link in the Member Type column. He will remain as a Guest as well as a Prospect. We have further definitions and explanations in a separate article regarding Prospects, Guests and Members, and how those were designed to be used in TouchPoint. The Meetings tab displays a list of all the meetings for this organization, with links to those Meetings. This is also where you Create a New Meeting , and can Show Future Meetings . General - These are settings such as Location, Grade, Description, Entry Point, and Directory settings. Attendance - This is where you add Schedules. Extra Values - Extra Values for the organization display here. Use a toggle to change from Standard to Ad Hoc. You can add EVs here as well. Registration - This is where you set basic information for your online registration. Fees - This is where you see the Deposit, Fees, GL Code, and more items relating to payment for an online registration. Questions - This tab is where you select all the drop-downs, check boxes, yes/no questions, and more for your registration form. Messages - This tab is where you compose the email confirmation, any instructions, and more relating to your registration. There are a number of options available on the Toolbar, including Email, Exports, Reports, and Actions. Several of the tabs have drop down options when you click on them. The drop downs options will differ slightly if you are viewing other People tabs. Add People - You can search and find individuals to enroll in the organization. Update Members - You can update member types, drop members, and much more. Be sure to use the check boxes or sub-group filter to get the group of members you want to update. Drop Members - Just like the Update Members option, select those you want to drop, and then select this option. It will open a dialog box letting you know how many people will be dropped. The Members, Inactive, Pending, and Prospects tabs have similar options as those under the Members tab. You must actually click on the tab in order to see the drop down arrow. This is a quick way to find an individual in an organization when the list is long. Enter first and last name, just the first name, just the last name, or enter just the first few letters of each name. You can also enter a People ID#. The name filter works on any of the tabs you are viewing. Press Enter or the Filter button after entering the name. Select a sub-group from the drop down, or enter the name. Use a semi-colon to separate multiple groups. If you select them from the drop down the semi-colon is added automatically. To exclude a sub-group, lead with a minus sign. If you have several groups that begin with the same first few letters and you want all of those groups, enter those letters followed by an asterisk. To find those with no sub-groups assigned you can select NONE from the drop down. To find people who are in each of the groups specified select ALL from the drop down. Press the Filter button after identifying the sub-groups. In various places on the organization page and throughout TouchPoint, you will see the icon of a small i inside a blue circle. Click that to view help information about that item. Press the clear button when you have finished with the filtered list. The Filter button will display (filtered) in red when you are viewing a filtered list. The button has several options related to the check boxes beside the names. After you check some names, select Filter Checked Individuals or just press Filter. You can also select Check All to select everyone on the tab you are viewing. When you want to remove the check marks select Check None. The names on every tab have a check box beside them. You can use these on one tab or you can use Options > Select Multiple , click on the tabs you want to view Members and Guests, or Members, Guests, and Prospects, or whatever combination your want. You can then check the names of those you want to email, print a report for, add to a Tag, or whatever you need for that group of people. Be sure to press the Filter button after checking the names. You can actually go to each tab individually, click the names of people you want, and then select Options > Show Multiple , select the tabs where you have checked individuals, and then press Filter. You will then see one list of everyone that you checked. Pay attention to how this number changes based on whatever filter you are using. This will be the number of people you will email, or update, or add to a tag, or whatever you select to do.